Use the links below to access articles, calculators, and other tools to help you along your way to financial freedom. First Step to Financial Freedom: No credit card debt and no outstanding balances on any credit card (this includes department store cards, gas cards, travel cards, and major credit cards). Financial Freedom: No outstanding debt except for your mortgage. This includes all balances with banks, credit unions, car loans, personal loans, and no second mortgage. 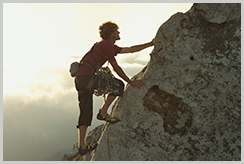 Total Financial Freedom: No credit card debt, no outstanding debt, and no mortgage debt. You are completely debt free! Financial Freedom Awards for those who completely pay off their debt. 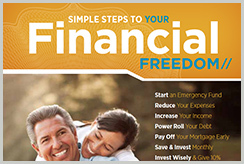 Use these PDF's and booklet to help you achieve total financial freedom. 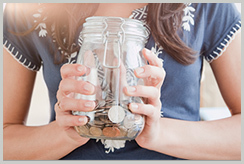 An easy-to-follow plan to help you achieve your financial goals for a better, more fulfilling life. Track spending with your own budget sheet for this coming month. Set dates for when you plan to achieve your goals. "It’s a philosophy of increasing income, decreasing expenses, and living within our means. It places your family on a path to real financial freedom and makes the concept of financial wealth a reachable goal." Use these free online tools to help calculate answers on financing, investment, and retirement. We cover everything from refinancing your home to which IRA makes the most sense for you.